Silver rounds make an excellent addition to any precious metals portfolio. 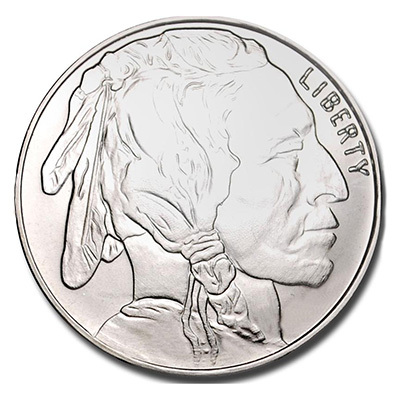 Silver rounds are privately minted, coin-shaped silver pieces. They are not government minted and therefore not considered legal tender. They do not carry a currency denomination. However, like silver coins, they are generally stamped on both sides with meaningful designs, and are stunning investments. Rounds have a purity of 0.999 and contain one troy ounce of silver each. Silver rounds are an alternative to bullion coins and offer low premiums relative to sovereign coins. They are liquid and reasonably easy to trade. Investors should note that the resale value of silver rounds is usually lower than that of sovereign coins. Add a 1 oz silver round to your investment portfolio today. The 1 oz Silver Great Britain Britannia coin is a striking silver coin that is sought after for its beauty and quality. 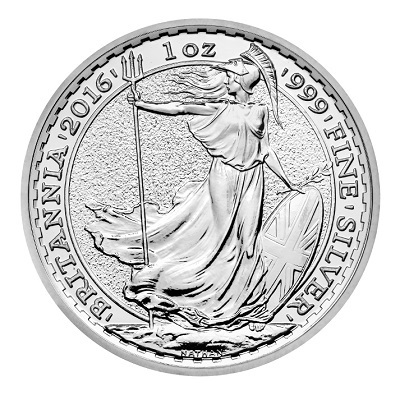 The Silver Britannia contains one ounce of 0.999 fine silver bullion. Backed by the British government, this coin has a face value of £2. It is eligible for precious metals IRAs. The front of the Britannia displays her Majesty Queen Elizabeth II. The back of the coin shows the internationally recognized figure of Britannia. The 1 oz Great Britain Britannia is a fantastic addition to any bullion collection. Add a 1 oz Great Britain Britannia silver coin to your collection today. The American Silver Eagle coin is the most popular silver coin in the world. Valued for their elegance and investment appeal, Silver Eagles are both well recognized and highly liquid. They represent an excellent way to add silver to an investment portfolio. 1 oz Silver Eagle coins are minted from 99.9% pure silver and contain one troy ounce of silver. Backed by the United States government, the 1 oz Silver American Eagle coin has a face value of $1 US and is considered legal tender within the US. It is eligible for precious metals IRAs. The front of the coin shows Lady Liberty draped in an American flag, while the back displays an eagle below 13 small stars, representing the original colonies. If you are considering investing in silver, the American Eagle is an excellent choice. Add a 1 oz American Eagle silver coin to your portfolio today. The Silver American Eagle coin is the most well-known and highly-regarded silver coin in the world. Valued for its beauty and investment appeal, the Eagle is always in demand. 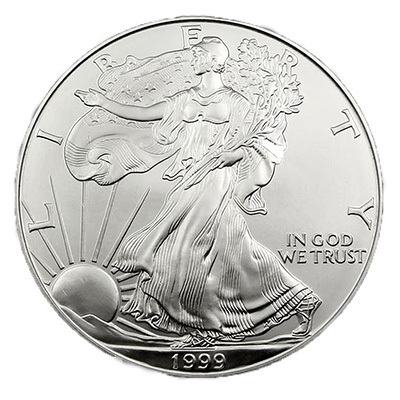 Each 1 oz Silver Eagle coin contains one troy ounce of silver bullion, minted from 99.9% pure silver. The Silver American Eagle Monster Box contains 25 sealed tubes each containing 20 Silver American Eagle 1 oz coins. In total, the box contains 500 troy ounces of silver, and is therefore an excellent way to acquire a large amount of silver with just one purchase. 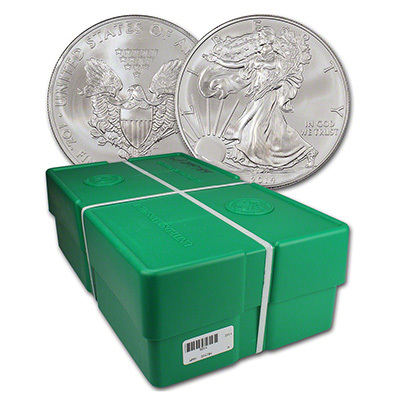 Each box comes directly sealed from the United States Mint. Investors should note that each box is more valuable if it remains sealed, as it can be resold without having to be inspected. Buy the Silver American Eagle Monster Box for your portfolio today. The 1 oz Austrian Philharmonic is a charming silver coin that is well recognized worldwide. Each Austrian Philharmonic Silver coin contains one troy ounce of 0.9999 silver. Guaranteed by the Austrian Mint, this coin has a face value of 1.5 euros. It is eligible for precious metals IRAs. The front of the Silver Philharmonic features the Great Organ of Vienna’s Golden Hall. A selection of musical instruments is displayed on the back of the coin. An elegant coin, the Philharmonic is an excellent addition to any precious metals portfolio. 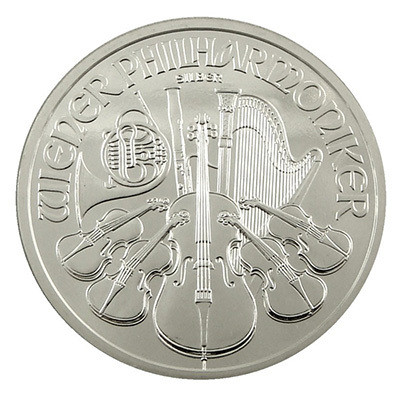 Add a 1 oz Austrian Philharmonic silver coin to your collection today. The Silver Maple leaf is one of the top-selling and most highly regarded silver coins in the world. 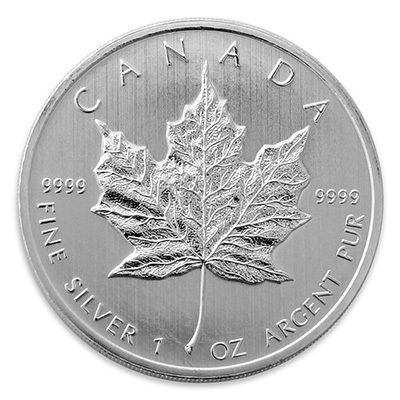 Minted from 99.99% pure silver, each stunning Maple Leaf contains one troy ounce of silver bullion. A well-recognized coin, the Maple Leaf features Queen Elizabeth II on its front, with the iconic maple lead on its back. This coin is backed by the Canadian government with a face value of $5 Canadian. It is legal tender within Canada. Due to its worldwide popularity and liquidity, the Canadian Maple Leaf is an excellent choice if you are looking to buy silver coins. It is eligible for precious metals IRAs. Add a 1oz Canadian Maple Leaf silver coin to your portfolio today. A Silver 90% Bag contains a selection of silver coins dated pre-1965. 90% pure silver coin bags contain a variety of coins such as dimes, quarters, and half dollars that were circulated in the US in the past. The composition of each bag varies, and the denomination of coins will change from bag to bag. However, each bag has a face value of $1,000 US dollars and contains approximately 715 troy ounces of 90% pure silver. 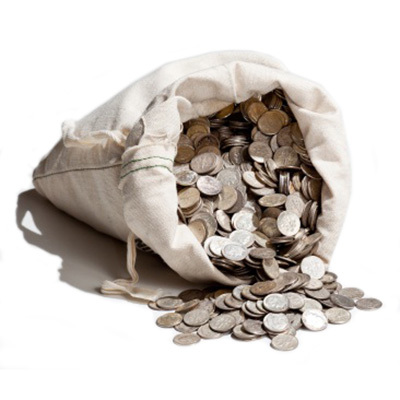 The silver coins come packaged in a heavy-duty canvas bag, making them easy to store and transport. The Silver 90% bag offers excellent flexibility, enabling investors to break down their investment into small denominations. Buy the 90% Silver Bag for your collection today.